Hi there! I hope you are finding time to relax and enjoy the summer! I can't believe how quickly the new school year approaching. Many of you are already planning and prepping your return. I know I am! However, along with supply buying, blog stalking, pinning, team meetings, and a little bit of actual planning, I also need to make a plan to renew my teaching certificate. In our district we need to renew our certificate every five years. In order to do so, we need to earn six continuing education credits; which can be through our County or at an accredited college. It's great to take them through the County because they are offered at a discounted rate and we get fully reimbursed once we finish. 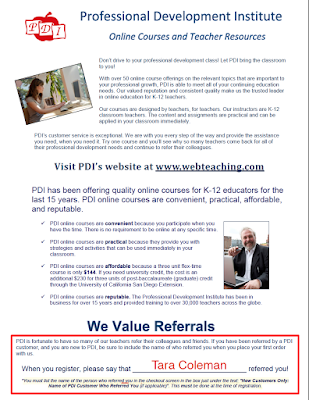 However, they are just that...CPD credits. They are not college level credits. If you are in need of your Masters, Masters +30, or Doctorate they do not count. I usually like to take summer classes, but it just didn't work this summer. So, since my certificate expires at the end of this upcoming year, I need to finish getting my credits during the school year. As you know, life can make it difficult to physically attend classes at a college. Luckily, there's tons of websites that offer on-line classes. I never really thought I would like an on-line course. I'm more of a...meeting with others~listening to an instructor~taking notes kind of student. But, I had to take an on-line course last year and LOVED it! I could do my work in my pajamas, laying in bed, at any time of the day. YES!!!!! 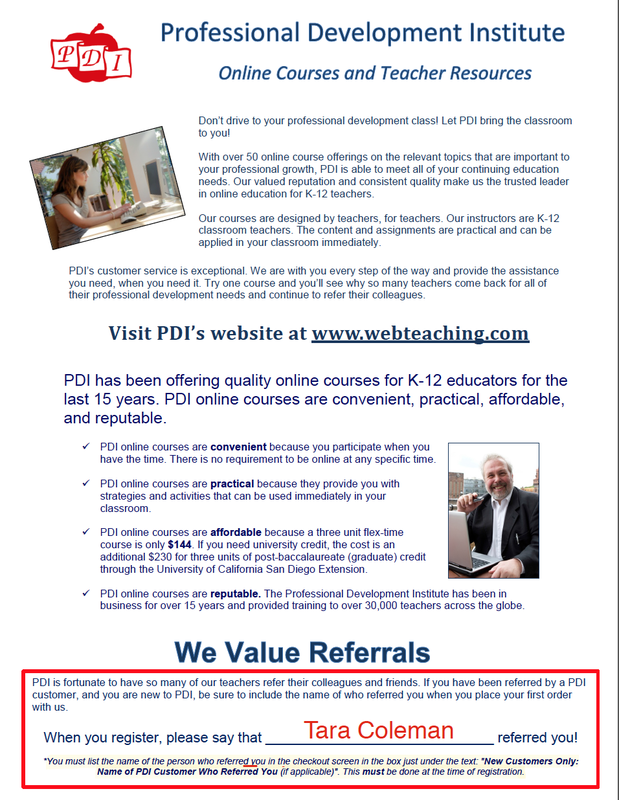 Recently, a friend of mine directed me to an on-line campus called, Professional Development Institute. They offer semester and flex courses. A semester course has a specific deadline with assignments due by that date. 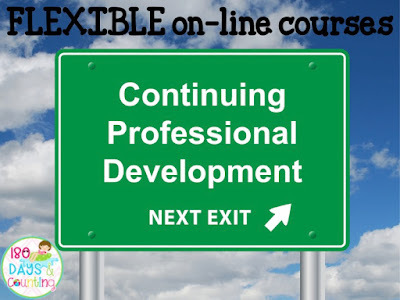 If you take a flex course, you have up to 1 year to complete your assignments!!! That's right, ONE YEAR. So, if you're not in any rush this is definitely for you! I just registered for, Implementing the Second Grade Common Core Lit Standards/Flex Course. I'm looking forward to delving into the ELA literature standards and sharing ideas with others on-line! Courses are available Pre-K through High School. There's something for everyone!! If you are interested in registering for courses, download the flyer below. When registering, I would appreciate it if you mentioned my name in the checkout screen box.